In statistics, a outlier is defined as a observation which stands far away from the most of other observations. Often a outlier is present due to the measurements error. Therefore, one of the most important task in data analysis is to identify and (if is necessary) to remove the outliers. There are different methods to detect the outliers, including standard deviation approach and Tukey’s method which use interquartile (IQR) range approach. In this post I will use the Tukey’s method because I like that it is not dependent on distribution of data. Moreover, the Tukey’s method ignores the mean and standard deviation, which are influenced by the extreme values (outliers). I developed a script to identify, describe, plot and remove the outliers if it is necessary. 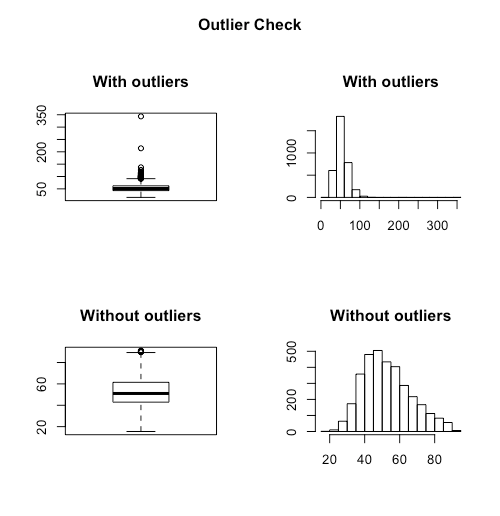 To detect the outliers I use the command boxplot.stats()$out which use the Tukey’s method to identify the outliers ranged above and below the 1.5*IQR. To describe the data I preferred to show the number (%) of outliers and the mean of the outliers in dataset. I also show the mean of data with and without outliers. Regarding the plot, I think that boxplot and histogram are the best for presenting the outliers. In the script below, I will plot the data with and without the outliers. Finally, with help from Selva, I added a question (yes/no) to ask whether to keep or remove the outliers in data. If the answer is yes then outliers will be replaced with NA. You can simply run the script by using the code below. Replace the dat with your dataset name, and variable with your variable name. I am aware that the scrip can be improved by adding other features, or revising and cleaning the code. Therefore, as always your feedback is appreciated. Leave a comment below, or contact me via Twitter.